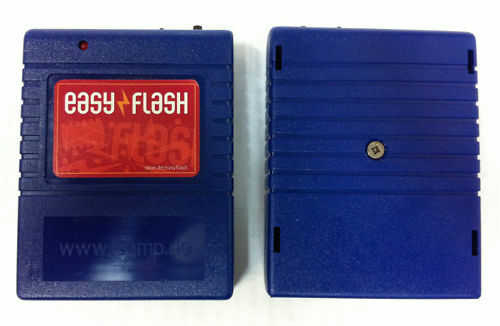 Last Thursday I received an EasyFlash cartridge from Mike Betz of Antelope, California. He's building these carts and selling them on eBay for $35 plus $5+ in shipping plus sales tax for those who live in California. Arriving a few days after placing my order, the cart came is a small, padded mailing bag with just about $1.34 in postage, not even close to the $5+ charged for shipping. No other materials (like instructions) came with the cartridge. The cartridge casing is solid to the touch, blue in color, has a nice label, and has an LED, a slideswitch that selects normal or flash mode, and a reset pushbutton. The casing is embossed with the name of its German manufacturer. The holes in the casing for the switches and the LED look to be hand-drilled or cut open with an Exacto knife. After removal of the center screw, the casing comes apart fairly easily, exposing its board with all the components taking up nearly all of the board space. The components all seemed to be well-soldered onto the board. We plugged it into the club's flat C128. Upon power-up, there is an EasyFlash title screen with a little bit of animation. A nice touch! Then it presents you with a menu of what there is on the cartridge. To go up and down the menu, you can use the cursor keys, a joystick, or the F keys. To our surprise, there were a number of game titles already on the cart -- no need to immediately learn how to flash a new cartridge image into it. We tried a few games. Several of them presented just a blue screen, no cursor, no other activity. I attributed that to the games being PAL versions, and we were using a NTSC C128. Some games ran just fine, like Frogger. I have not yet tried to flash a game into the cartridge. To flash a game with the use of a C64, you download the program, EasyProg, from the above website, and then run the program. The site advises that you should have a large device, like the FD-2000 disk drive or a uIEC card drive, in order to hold large cartridge images. When I followed the site's links to where the images were, I was presented Google pages from which to grab the images; the problem was that Google had hundreds of hits, and you'd have to look through every one so that you could get the image you wanted.